The Big Bang Theory returns to Nine on Tuesday April 9 at 7:30pm. 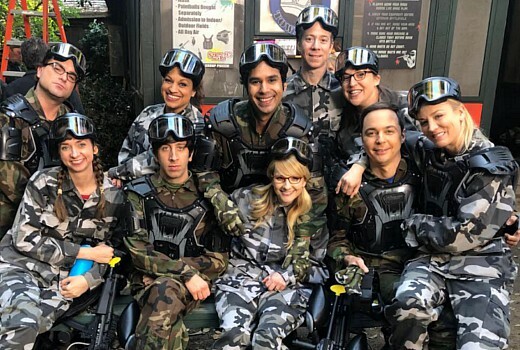 “The Paintball Scattering” is Episode 11 of the final season which aired in the US in January and is one of 7 eps that have screened there so far. The last ever one-hour episode of the hit series is set in the US for May 16 (US) meaning we would need some double episodes to catch up. Next week Married at First Sight drops back to 3 episodes, with the likelihood of a 2 part finale tipped for April 7 & 8. It’s about time for TBBT. Hopefully they will do double eps to catch up. Much better than having a new ep, then a recent ep repeated after. Not quite. According to the Wikipedia episode list there’s still 3 more episodes of Season 2 that haven’t aired here yet. The last one hasn’t aired in the US yet either (April 4, almost 4 weeks after the previous episode for some reason), but that still means 2 more episodes that have aired in America but are yet to air here. If the US are have a four week break of Young Sheldon, hopefully it means we will catch up. I meant 5th April not August, too far ahead of myself. Wonderful. Thanks for the news David! Finally. I knew they’d resume once Married at First Sight finished, but at this rate it felt like 9 was going to keep milking that show for ratings all year! At the same time they’ve pulled Young Sheldon off the air suddenly without any announcement because of the NRL. At least they could have told us when it was coming back at the end of the last episode.